Here is another of our Easter recipes, which goes fabulously with ham. 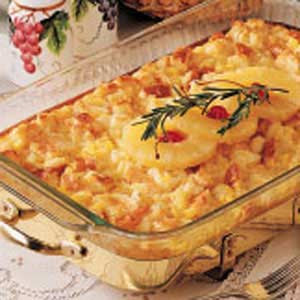 Enjoy this Scalloped Pineapple Recipe, or as we call it, our Pineapple Casserole. It’s sweet and tantalizing and the perfect compliment to that Easter ham. Preheat oven to 350 degrees. Drain pineapple, reserving 3 tablespoons juice.Combine sugar, flour, and 3 tablespoons reserved pineapple juice. Add cheese and pineapple. Mix well. Spoon into a 2 quart greased casserole dish.Combine butter and cracker crumbs and sprinkle over pineapple mixture. Bake 30 minutes, or until crumbs are lightly browned. Garnish with pineapple rings, maraschino cherries, and rosemary sprig for garnish (optional).Serves 6This recipe, and 349 others can be found in our cookbook “Rocky Mountain Lodge & Cabins Favorite Recipes” which can be purchased in our Gift Shop. Click Here to order your copy. This entry was posted in Uncategorized and tagged Fruit Recipes, Holiday Recipes, Side Dishes by Debbie Reynolds. Bookmark the permalink.